... or rather, in a little less than an hour, but we're counting down! I've been sadly absent and distracted this week... nothing serious, just kind of got myself hooked into one of those addictive mobile games. 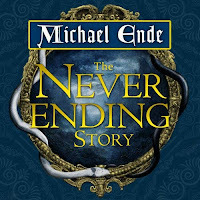 -_- The only reading goodness that came out of that was that it gave me a reason to spend time on my ongoing audio book, The Neverending Story. Given that I usually have about three books going (one audio, one e-book, and one hard copy), the only time I spend listening to an audio book is during my drive to and from work, or if I'm doing some multi-tasking in which I cannot actually focus on reading text. So I managed to get pretty far in The Neverending Story, which is still a bit flat for me, but is proving to at least have some interesting adventuring going on, even if some of it seems a bit dragged out. But I only have about three hours of this thirteen hour book left, so I DO feel like I've made SOME progress this week. At the stroke of midnight...! I shall stay awake and read for at least two hours... or at least I'll try. And then I shall wake up in the morning and post an update about it around 8:00 A.M. At least I'd like to think I will. We'll see. Realistically, my goal would be to finish the above books. How I can even think about other hopeful reads is a bit of a reach. HOWEVER, on the off-chance that I figure out a loophole around our space/time continuum, I would really like to get to the following other books.